I made a plea a couple weeks ago about the need for a plan for my next marathon in March. I got some great feedback from some friends (Thanks Jill and Taryn!) and so far things are going well. I have suffered in the past from IT band and peroneal issues so I am treading very lightly while ramping up my running. The one thing that I am doing differently is that I am taking the time after every run to stretch. I know you are thinking “Duh Becca!” but I have never been good about this part of training. I want this Ironman next year and I want it bad. I will only get there if I get serious about my training. 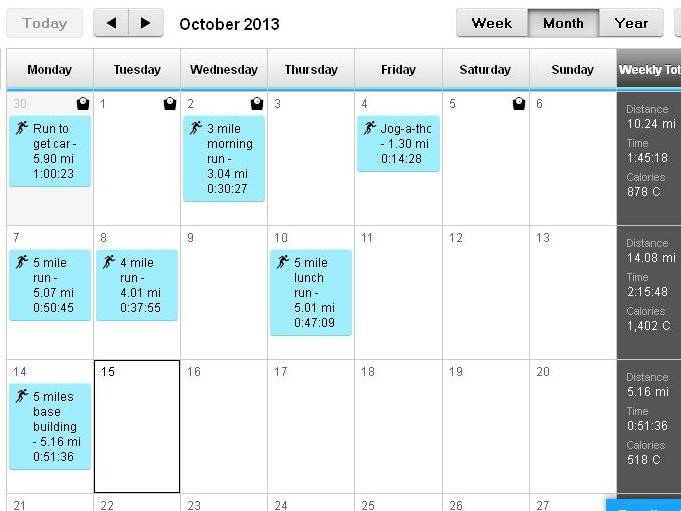 I hope to keep steadily increasing my weekly mileage and staying injury free over the next month. Then it is time to get my marathon training going. Wish me luck! Good Luck! I can’t wait to see how you progress. For me, the key to managing the IT band and peroneal (we must be kindred spirits!) was LESS running and an ASSLOAD of riding. But I wasn’t trying to run a standalone marathon…obviously very different. I did 3 runs/week throughout my IM training, but NO speed work and utilized hills to build strength which carried over to speed. Then of course all the cycling naturally built tons of strength and if I could muster a 10, 16, or even 18 mi run after riding 200 miles during the week…AND still hold up, then I felt…and do feel pretty good about things. I won’t set any records on the run course right now, but I feel like I FINALLY have built up some good tendon/ligament durability so that I can spend next year focusing on speed!! Wooo-hoo!! Speed….what the hell is that???!!!! Enjoy the consistent training once again! !